On August 30, 2016 I met my new member, Kurt Frederick. Kurt decided to train with Superb Heal because he found our name on a poster at Saffron Yoga, where he practiced yoga. He was looking for a place that focused on functional fitness training techniques, rather than Crossfit which he considers risky.And, while Kurt was in great shape, heI was looking for a consistent way to maintain his level of fitness. In October, 2016, he started with some group classes we were offering. This option appealed to him because he likes social facilitation and the sense of community that come with classes. In March of 2017,he started with one-on-one personal training because of the flexibility it offered for his scheduling needs. Today, three years later, Kurt has become a HUGE inspiration to me. The kind of shape he’s in far exceeds the norm for anyone, much less a man of 66!!! But then again, by 8:15 AM on any given day, he’s already lifted more weights at least 90% of Americans. Kurt will tell you he sees his training here as an investment in his health and fitness. He also sees our relationship as another investment. So, while I read that very first email address wrong, it’s actually “biking yogi” not “bikini yogi,” the excitement I felt for whoever was about to walk into my door, has surpassed anything I could have imagined. Thank you Kurt for allowing me the opportunity to train with you! I’m looking forward to our future discussions and to shattering some state lifting records!! 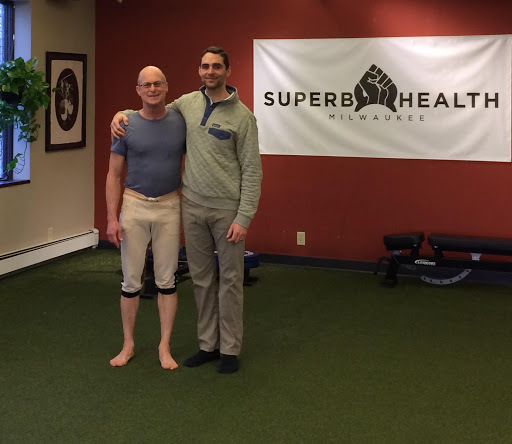 Kurt, you are an inspiration to me and I am honored you have chosen to train at Superb Health! But, it’s not just me. After three years, I still have l young athletes whose eyes literally bug out when they see Kurt train. He is a rock solid man and an inspiration to everyone!